Regeneration is a green realty trust, promoting sustainable business through eco-friendly commercial property ownership and renovation. Visit us in Portsmouth, NH. Lease a space for your business. Trench Work in the New Restaurant Space is Beginning! More progress to report on Regeneration Park. Trenches are now being cut to accommodate new plumbing and wiring for the restaurant-to-be. 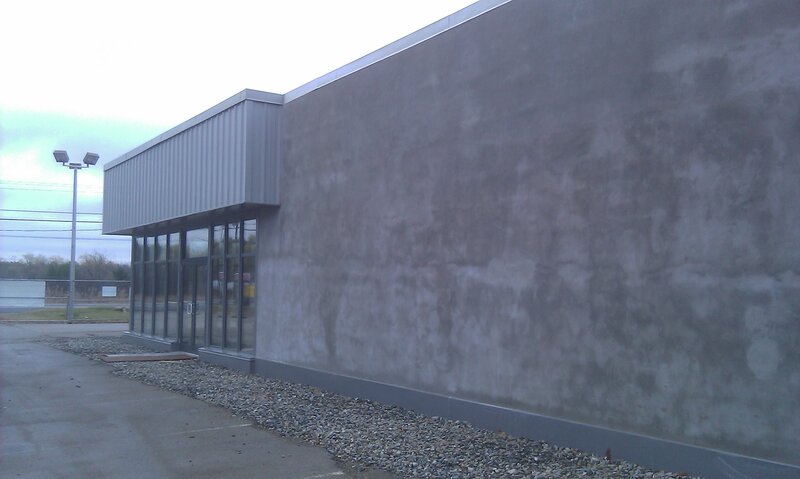 Since the building is being regenerated, the new restaurant will maintain the existing concrete floor from the former car dealership – grinded-down and sealed. The ceilings of the restaurant will be exposed, showing duct work and lighting elements while the walls and interior spaces will have a more traditional steakhouse feel to them. The combination of the contemporary floors and ceiling mixed with this traditional space will create a striking restaurant atmosphere.Â Stayed tuned for more new developments as Regeneration Park continues to take shape. The new color scheme is almost there!Â A beautiful new gray color is the base tone for the renovation and recycling of this exciting project.Â Watch over the next week as a very interesting “burgundy” color is added to the front of the building.Â This once blah, brownish -color metal building is being transformed into a modern visual building at the Gateway of Portsmouth along Route 1. Interior Changes: Up to 12″ of spray-in foam insulation is going in at the ceiling level and up to 6″ of foam is going into the wall cavities.Â This equates to an R-80 in the ceiling and an R-40 in the wall.Â Why so much?Â The envelope performance is the single biggest element in a building that can lead to positive energy conservation and reduced energy costs annually.Â By insulating correctly (and not with batt insulation) a project will see a better interior environment and better cost savings every year for the life of the project.Â Yes it costs more now, but paying extra today will insure a building with lifelong comfort and performance.Â Payback time for these types of “non-visual” items are sometimes difficult to sell to a client but it is the best money you can spend on the building. 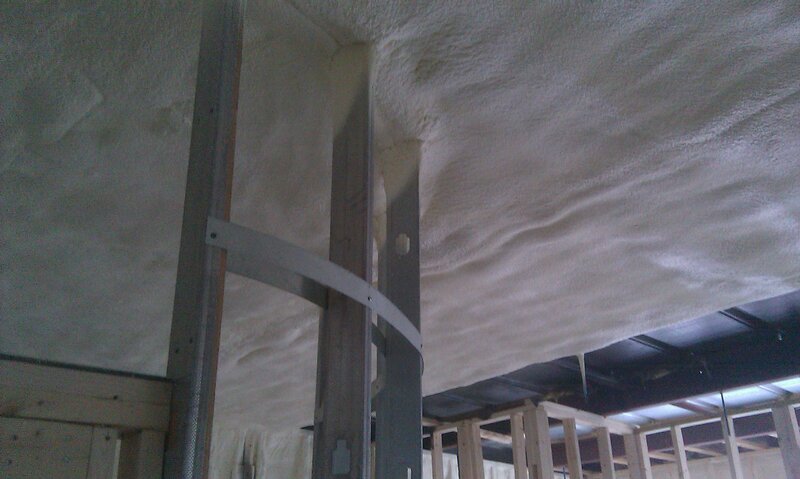 Insulation is Being Installed at Regeneration Park! If you haven’t seen our Serious windows, you probably haven’t driven down Route One. 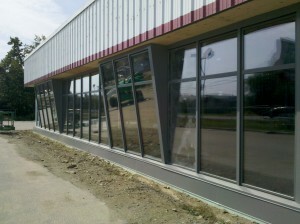 Â The front ofRegeneration Park is taking form quickly, with the added contours of our angled windows. The light flickers as you drive past, and inside, there’s next to no glare whatsoever. And, they’re super-insulating, it’s practically see-through insulation. This distinct layout draws your attention, and the cozy warmth they’ll provide in winter, will keep you inside! As the winter months come barreling our wayâ€“we know not the thing that you want to hear, but our tenant, Simply Green, can help!â€“doors have gone into place as well. Â Locked tight, and making sure that Regeneration Park gets a proper unveiling! Striving to have one of the largest solar arrays in the state of New Hamsphire is going to take some serious muscle. 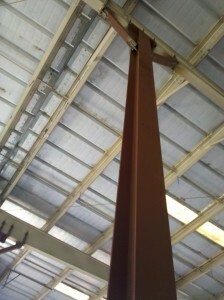 Â And, if Atlas had the world on his shoulders, these columns and trusses will be holding up the power of the sun! Â In order to support the additional weight of over 10 tons of solar panels, substantial support has to be installed: columns drilled into the foundation as well as steel trusses attached to the crossbeams. The work of TR Russell builders & TMS Architects in installing and engineering these supports has been nothing short of impressive. 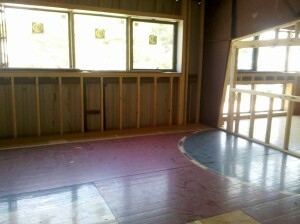 In the past months, the installation of the flooring in the marquee office space has come together. Â Instead of piecing the floor back together as a single basketball floor, the floor is borrowing from the spirit of Regeneration Park: coming together with the pieces it has on hand. Â With the guidance of Dwellings Done, the interior spaces are taking form as well! 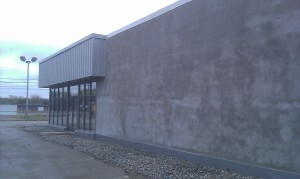 Core spray-foam insulation and exterior painting began this week. Restaurant and kitchen design completion in sight! As the work has progressed forward, one of our showcase tenants at Regeneration Park, and the business spearheading the project, Simply Green Biofuels have launched their initiative encouraging users of traditional heating oil to Join the Evolution! They’ve been distributing copies of Evolve: The Next Steps in Greener Living, a series of articles and tips that will help you learn how to live greener. Â They’re putting out the word that all it takes for greener living are a few steps. Â If you already recycle, have switched to CFL’s, and you’re looking for the next steps, keep your eyes open for your copy of Evolve. The newspaper is being distributed all throughout the seacoast and will soon be available online! We’re proud to have Simply Green be a part of Regeneration Park and as the project moves forward, we know that the growth of Simply Green will only make Regeneration Park stronger! If you haven’t seen the video above on WMUR-9 or in the Portsmouth Herald or on the front page of Foster’s or even in the Boston Globe, the Park has gotten some high-profile visitors this past week. As part of the visit, we also unveiled our intention to have the largest array of solar thermal and photovoltaic panels on a privately owned building in the state of New Hampshire. Â Our partners for the solar portion of the project were also present and had the opportunity to interact with the Secretary and Congresswoman as well! And, check back next week for pictures from the visit! Somebody’s coming to visit us at Regeneration Park tomorrow! Â Won’t say who yet, but it’s going to be BIG! Now that permitting is in place and the designs are finalized. Things are really starting to cook on site. 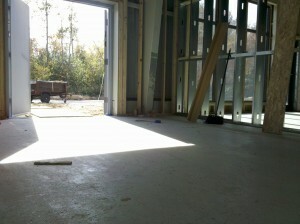 Â Contractors, lead by TR Russell Builders, are making huge strides in the building already. 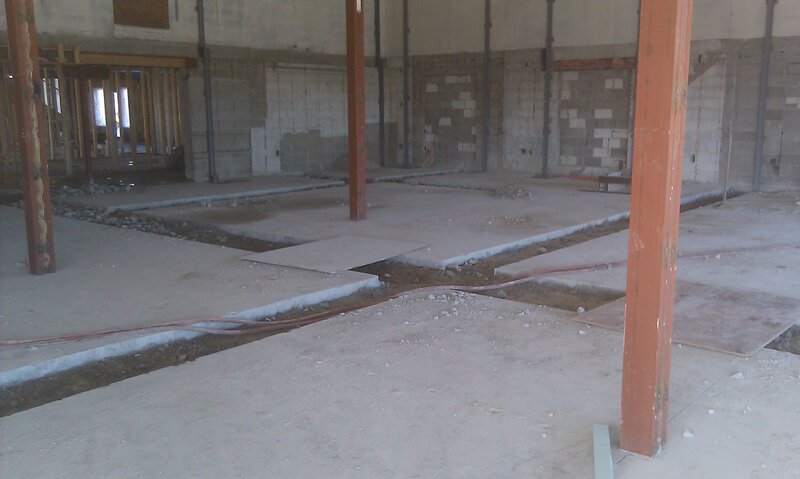 Â The shape is already starting to take form, and we’re all excited to see our spaces come to life. And, don’t forget to read the paper and check back by the end of the week for our visitor! Imagine going to work on the hardwood, walking on the floorboards of a legendary arena every single time you step into the office. We just unloaded pallet after pallet of the original floor for Cobo Arena, the home of the Detroit Pistons from 1961-1978, and it’s going to make up the floor for the largest office suite in Regeneration Park. On the same floor that Dave Bing and Bob Lanier used to hold court, we’ll be putting state-of-the-art office equipment. It’s amazing to think that the court has been waiting to find use for almost 40 years since it was first removed. We’re happy it has now found it’s home at Regeneration Park! Regeneration Park is already making headlines. SeacoastOnline.com recently interviewed Andrew Kellar, founder of Simply Green Biofuels and co-owner of Regeneration Park, about the new building and what it represents to southern New Hampshire. Regeneration Park, the brainchild of Simply Green Biofuels, is slated to be one of the first facilities of its kind in the area, a Zero Energy Building (ZEB) that strives to consume zero net energy and emit zero net carbon. The company is well on its way, but Kellar said he wants to see the building reach the lofty goals set for it. Who they are working with will go a long way toward that goal, he said. Think you might be one of those contractors or tenants? Be sure to contact us, and reserve your spot today. The regeneration has begun! We’ve added photos of the demolition process as we deconstruct the former car sales lot in Portsmouth that will be our future home. Items like insulation, wiring and vent covers are donated, repurposed and recycled. We plan to update the site with the names of the businesses and charities who’ve participated with us through donation, so please come back again soon. Welcome to the Regeneration website! We are working to update you on the latest news about Regeneration Park, our first eco-friendly commercial park, located in Portsmouth, New Hampshire. Follow us on Twitter or subscribe to the RSS feed for more. Thanks! Tenant space is now available for green businesses at our location in Portsmouth, NH. For more information, please call 603.430.9919, or write to info@regenerationpark.com. © 2010 Regeneration Realty Trust. All rights reserved. Web design by Stephen Bobbett.